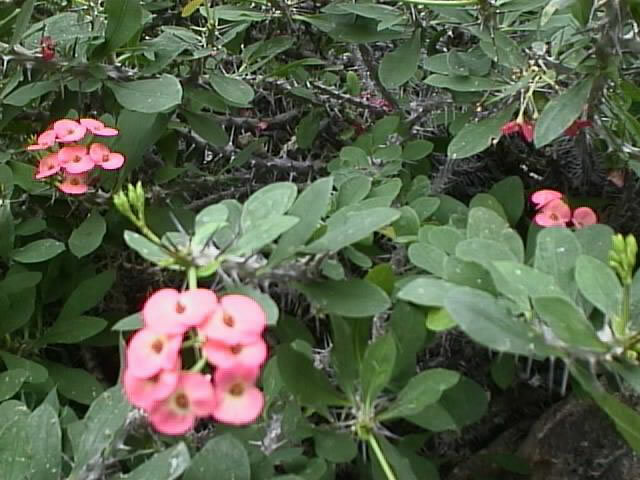 The Crown of Thorns is a woody, multi-stemmed, succulent shrub that originated in Madagascar. Dark green, tear shaped leaves appear randomly on each thorn covered branch. Normally, once the cause of stress is resolved, fresh foliage will quickly return to your plant. Crown of Thorns will produce flowers nearly all year, but especially during the winter months. The tiny flowers are insignificant but appear just above brightly colored red or yellow bracts. "My crown of thorns has developed some problems over the past several months. As background, I received the plant from my mom about 7 years ago (she's had it for about 20 years). I think it has bloomed, maybe, 3 or 4 times since I've had it. It was in fairly good shape (despite the lack of blooming) until I moved to NY 6 months ago. Before I moved I think I repotted it once in 6 1/2 years, it got plenty of sun and I generally ignored it, only watering it when the leaves would look dry and overly curly. Now the plant is not very full, the leaves get brown and yellow spots on them, proceed to dry up, curl over, turn yellow and fall off with alarming regularity and speed. Several leaves fall off every day. The plant isn't nearly as full as it once was and the spines on the stem are brittle and break when you touch them instead of poking you. I think it gets sufficient light (more indirect than direct) so I replanted it (regular potting soil) to see if that helps - well it didn't. They sprayed for termites a few months ago in the apartment - would that have anything to do with it? I water it about every 7 days year around - is that a problem? New shoots continue to emerge (but no flowers) so I think it can be saved. Please advise - you're my only chance." that the heating is different in your new home resulting in drier air. Because of their leaves, most people don't consider a Crown of Thorns to be a succulent plant, but in reality it is. They have limited water storing abilities, however, and often have to rely on moisture it takes in through its leaves so I would try misting your plant daily. You might also want to increase the amount of water you give it each time you water it. Crown of Thorns plants should be watered once a week when it is in a growth cycle, but only once a month while dormant. Whether dormant or actively growing, never water before the soil has completely dried. 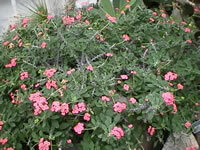 Once you have resolved the leaf drop issue, you should start feeding your plant monthly with 'half-strength' liquid house plant BLOOM fertilizer to get your plant blooming again. Crown of Thorns plants should have some direct sun each day, even if it just an hour or two. CAUTION! The white milky sap is VERY poisonous, use gloves and wash your hands thoroughly afterwards! First of all, you need to cut any of the rotted branches back to a point where you find clean healthy growth. If the rot started in the roots you may only be able to salvage a lot of cuttings, however if the rot is only at the branch tip, you can cut it back to healthy wood, and your plant will come back from the rootstock. It is possible to take and root cuttings from a Crown of Thorns plant but they take a little more effort and time than most cuttings. Using a very sharp, clean knife (I like single edge razor blades) cut a branch off at the point where it meets the main trunk. Set the cuttings aside in a cool dry place for two or three days to allow the cuts to callous over. Once the callous has formed, dip 1-2 inches of the cut end into a rooting hormone, such as Roottone®. 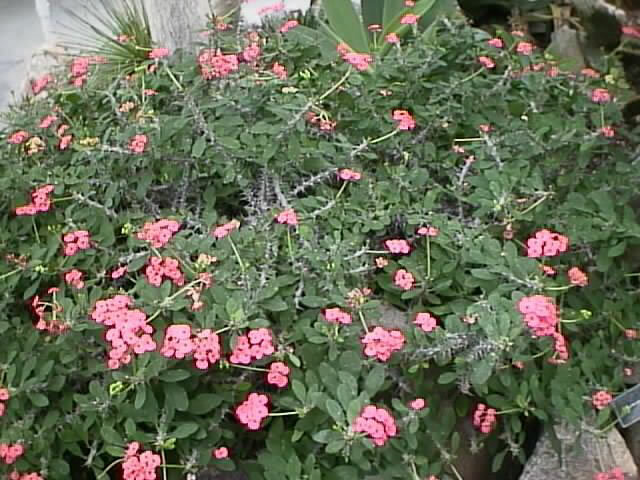 Insert each cutting into a clean pot of sterile, sandy potting soil. Rooting will be faster if the soil is kept at a constant 75° F.
I suggest that you take several cuttings to be sure that you succeed with at least one of them.